Last week I had the good fortune to visit the collections of the Ulster Museum in Belfast with the National Museums Northern Ireland’s Curator of Vertebrates Angela Ross. It’s always a valuable experience seeing other museum stores and it was a real pleasure to meet Angela and talk about our shared experiences with collections. 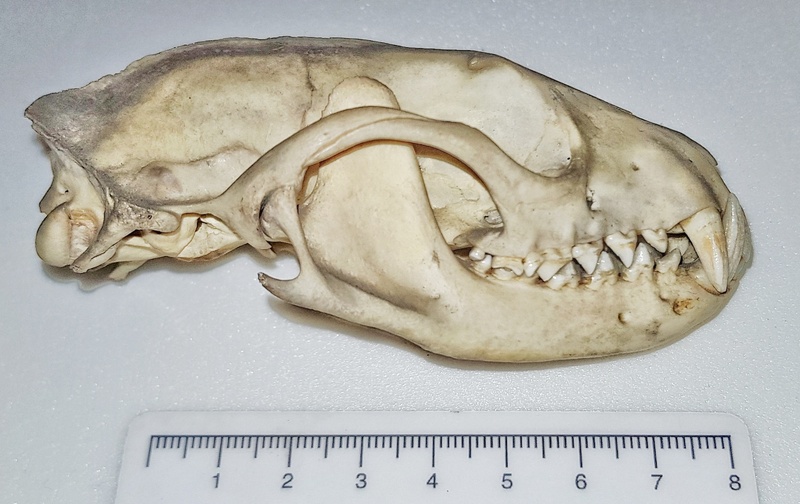 As you might expect, as with every museum in the world, there are one or two specimens that have lost labels or that have never been identified, so I was fortunate enough to be get some photos of one such example for today’s mystery object. Any idea what this skull was from? It has similarities to specimens I’ve featured in the past, and in the answers to those I’ve provided links to identification resources. If you have a rough idea of what this is, it may be worth your while using the search box in the top right corner of the blog to look for more information to help you narrow it down. Have fun hunting for an identification – I know I will! A certain central African nocturnal tree-dwelling feliform that was once grouped with others that share a similar name but is now its own family. Sorry to be a drag, but I’m always confused by the modes of measuring. Is this ruler in inches? Hmmm… probably confirmation bias, but I am going with it being a v, genus G. Species… ulp. For what it’s worth, Paolo, I cannot get to that matrix from my phone. So now I have a legitimate excuse for not being hubristic enough to try for a specific name/id. In many ways, so similar to a raccoon. But the carnassials, not…. 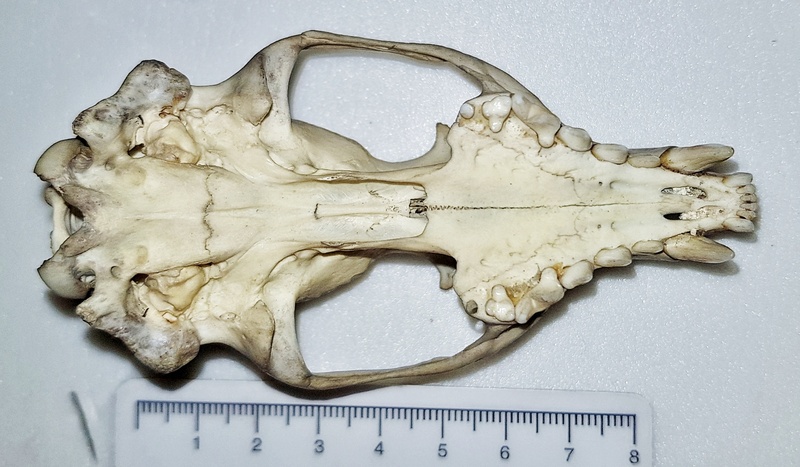 I thought this looked really familiar, and like James, thought maybe racoon, but looking at that tiny little molar, found it to be felineish, so now have no idea. I agree with Sally, this ruler was a little confusing. I guess I am used to metric rulers that are in mm, not cm, or at least are labelled cm. But, now that you have cleared that up, I will no longer wonder. 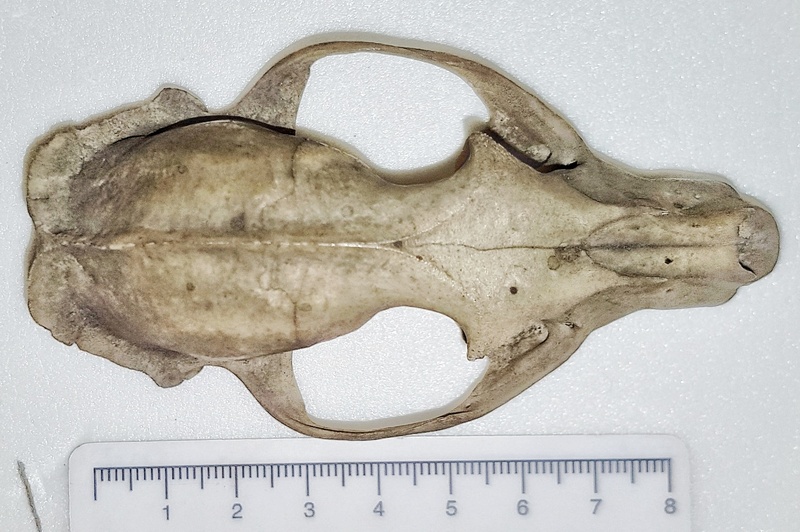 Kind of like an ocelot, but seems to have more teeth, and those zygomatic arches are fisher-like, but a lot heavier than my specimen. Great skull. And, as I said, I don’t SEE anything on the outside of the bullae to suggest a septum. So I’m currently guessing something Caniform. I think dogs, bears, and weasels have all lost the third upper molars. So I think my next step will be look for skull images of Procyonids and Red Pandas. Foiled again. Red Panda and Procyon lotor both seem to lack third molars. You did very well on the very similar Mystery Object #270. ..
Now that’s a very poor clue for you. I was just leafing through Mammal Remains From Archeological Sites by Stanley J. Olson, and his drawings show Felis onca, F. pardalis and Lynx rufus , all have that tiny molar, but he indicates that it is really a M 1. I’m utterly ashamed of myself. 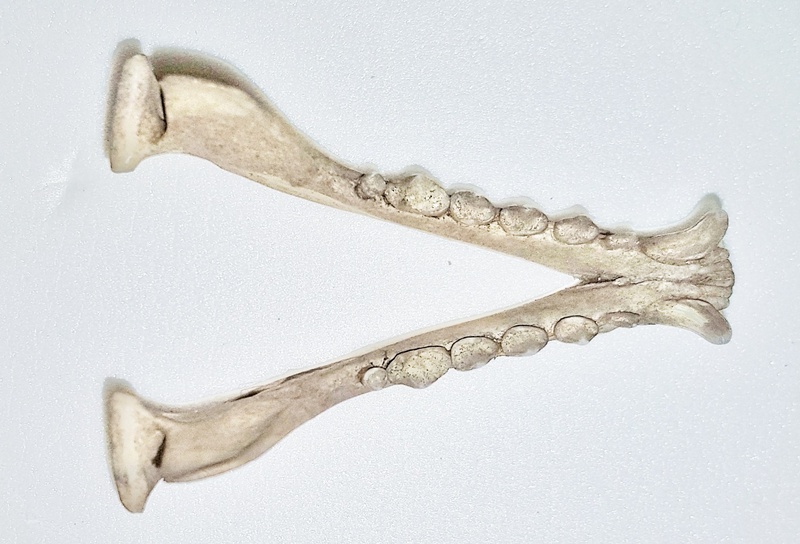 The (upper) carnassial is, as I know perfectly well, P4, but it’s SO much bigger and more elaborate than the anterior premolars that I’m afraid I thought of it as a molar. Which threw my count off. The vestigial little nubbin is M2, not M3. There is no M3. So: Feloidea is back in contention. As are Mustelidae and Procyonidae. I hang my head in shame. So. No third molar, and second molar reduced to a nub. This is, I take it, a thoroughly CARNIVOROUS Carnivoran. Gigi? Though not a dancer and not from France?